Part of the appeal of tart is that the dough tends to be more forgiving than pie dough, so you can get in a lovely fruit dessert without having to worry about rolling and trimming dough. Tart crusts are generally pressed into place and take the exact shape of the tart pan. They are meant to be more crumbly and less flaky than a pie crust, with a much higher sugar-to-flour ratio that leads to a somewhat shortbread-like texture. 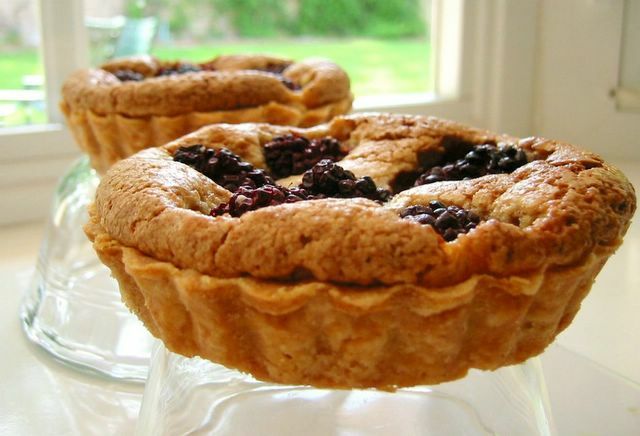 Broadly speaking, there are two types of tarts: those with baked fillings and unbaked fillings. Unbaked fillings require that the crust be prebaked, much like a graham cracker crust. With baked fillings, you can often get away without prebaking, but it is a good idea if you want to ensure that the crispness of the crust is preserved. This is a blackberry studded almond tart, made with a very moist almond cream filling. It looks quite fancy, rather like a bakery dessert, but is fairly easy to make. You can use a tart pan with a removable bottom or serve the tart directly from a ceramic pan. This makes enough for two 9″ tarts, but I am giving directions to make one tart. We had leftover almond cream, so you may have to be inventive to use it up. If you want to maximize the amount of cream in your tart, fill the shell with pastry cream and leave out the berries. Garnish the tart with fresh fruit when you are serving it. Save the extra pastry crust for another tart. It can be frozen for up to one month. Combine flour, sugar and salt. Rub in butter with your fingers until it resembles very coarse meal. There should be pieces that range from sand-like to pea sized. It should not be completely uniform. Whisk together egg and vanilla. Pour into flour mixture and stir briefly. Using your hands, knead and push all ingredients together to form a ball of dough. Wrap in plastic and refrigerate at least 1/2 hour and up to a week. Grind sugar and almonds in a food processor. Add remaining ingredients and mix until smooth. Set aside. On a well floured surface, roll 1/2 of pastry dough out, turning frequently, to fit a 9 inch tart pan. Set dough in pan and push it down into the corner, keeping your thumb on top of the dough to give it a nice level edge at the top. Don’t worry that you may be pressing it too thin – you do not want to have a very thick crust in the corner!! Set a piece of parchment on crust and push it in until it looks somewhat like a cupcake wrapper. Fill with beans or pie weights and bake the crust for 10 minutes at 425F. Remove parchment and weights and continue baking for an additional 10 minutes. Fill hot tart shell with roughly 1/2 cup of almond cream, spreading it around with a spatula, until it is half full. Arrange berries to taste and lightly press them down. It is better to lay them on their sides so they do not scorch. Return tart to oven and bake for an additional 30 minutes at 375F. Anything with almonds! I truly love desserts with almond filling, baked or not. You’re welcome, Dreska. I agree that almonds always add great flavor and texture to desserts. I have 5lbs of ground almonds in my pantry. This looks like a good reason to open the bag! well, i love my frangipane and any baked goods with almonds and marzipan kind of flavours. too bad i am on a diet. Oh no! A diet! The food blogger’s nemesis. 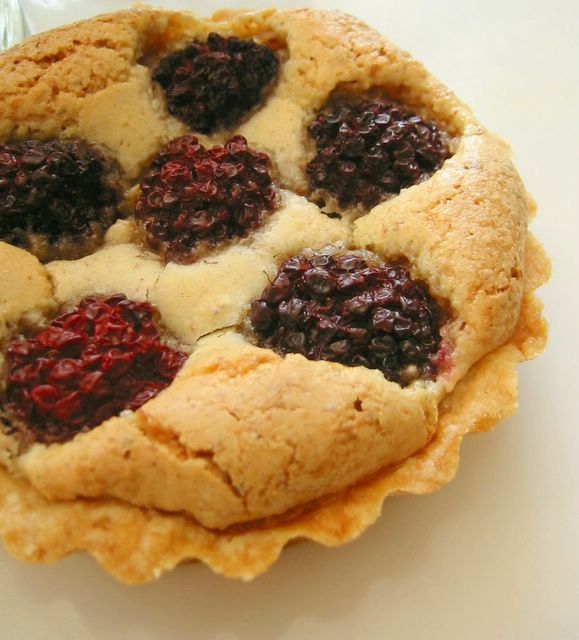 The solution is clearly to make bite sized tarts that just have a dollup of frangipane. That way you can still have a whole one to yourself!